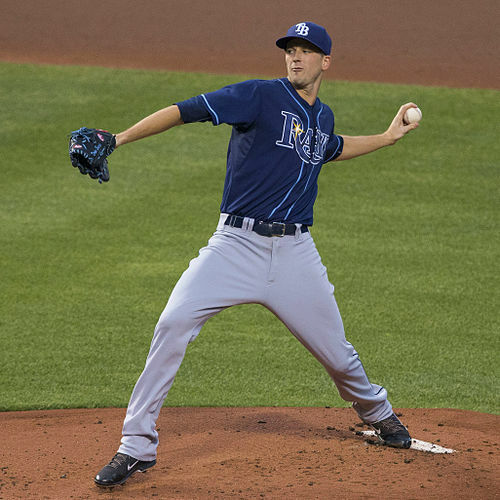 Home » Texas Rangers » Step one, Drew Smyly. Lost in the news that the Rangers have a new manager in Chris Woodward was the news that the Rangers on-field rebuild has started. They now have a starting pitcher to go along with Mike Minor. Smyly actually never pitched for the Cubs in 2018. In fact, he pitched just one inning of minor league ball. And he didn’t pitch at all in 2017. That’s because he’s coming off Tommy John surgery. This is reminiscent of two recent Jon Daniels acquisitions, the aforementioned Mike Minor in 2018 and A.J. Griffin in 2016. Both were coming back from missing two years due to injury. Minor had more success than Griffin, who had a few stretches of brilliance. In five seasons, Symly pitched for Detroit and Tampa Bay, mainly as a starter, but he put up his best numbers the year he came out of the pen for the Tigers. That year, 2013, his second in the big leagues, Smyly pitched in relief in 63 games, going 6-0 with a 2.37 ERA and a 1.039 WHIP. His final season with Tampa Bay, in 2016, Smyly started thirty games, went 7-12 with a 4.88 ERA. Overall, he’s 31-27 with a 3.74 ERA. If the Rangers are able to get anywhere near that kind of production from Smyly this season, it would be a godsend. Especially for $7 million. His best pitch, according to Fan Graphs, is a four-seam fastball, which sits at 91 MPH, which he throws about 55% of the time, generating a higher rate of fly balls than most lefties’ four-seamers, with fewer swings and misses by comparison as well. He also mixes in a curveball about 20% of the time, and a cutter about 13%. Occasionally, he will throw a splitter or a changeup. Coming back from Tommy John surgery is a crap shoot. The Rangers have rolled far too many snake eyes from the bargain barrel. Maybe they are due to roll a seven. That’s usually what comes out unless I’m being very careful. Yup, and I couldn’t pronounce it then either. I think there’s an “n” in there. Edinson. What’s with this “player to be named later” stuff”? A farm system usually has in excess of two hundred players, most of which have not been scouted by the receiving team. So what happens is the sending team assembles a list of players they are willing to let go, gives it to the receiving team for approval. Once both sides agree to the list the receiving team then has time to scout the players on the list, discuss it among the members of their staff and make a decision on which player they want. It’s a pain for impatient fans like myself, but it’s a way for both sides to be happy. True! Usually from short A, A or A+ and of the high risk, high reward type. A “player to be named later” seems like it should be a term for someone who hasn’t been born yet. But then again this may actually be true as far as their professional career goes. Because most of them in that regard “ain’t been born yet”. Evan Grant is so stupid….wonders if Maz needs to be a trade chip, cuz he hasn’t shown enough???????? What does fatty want to see? Guy could possibly end up being our best player….How do these guys stay employed??? He’s been wanting to trade Mazara for at least two years. Why? I dunno, sumpin’ stuck in his craw. Sophomore year not nearly as good as first year and his D fell off dramatically. But the whole team’s D sucked so he was just part of the crowd. Still has tremendous potential and can’t imagine why he’d be on trading block.